T-Mobile will be offering a pretty sweet deal on the iPhone 6s: $20 per month on its Jump upgrade plan. That’s cheaper than Apple’s newly announced offer, but is it a better overall deal? Yesterday, Apple announced a new upgrade plan, which allows you to pay a starting rate $32/$37 per month for your iPhone 6s/6s Plus. If you want a configuration with more than 16GB (and you should), that’ll cost you. As with other 24-month plans, you’ll own the phone outright after two years—and you’ve got the option to trade-in your phone for a new one every year. (This of course restarts that 24-month payment period.) The deal comes with AppleCare as a bonus. It’s basically the opportunity to have the latest phone at all times for a monthly fee. A bit like a car lease. T-Mobile’s got a very similar deal for the much cheaper starting rate of $20/$24 per month for your iPhone 6s/6s Plus—over 18 months, as part of the Jump On Demand plan. At the end of that period you can give the phone back and be done, or you can pay, in the case of the iPhone 6S, $164 more and keep it. T-Mo’s Jump On Demand plan allows you to swap your phone up to 3 times a year. So it’s pretty clear, which one is the better deal. T-Mobile says that this is an introductory price. And it’s a very good one. 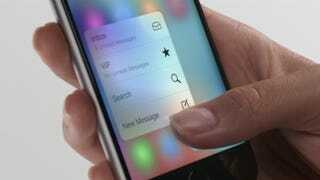 The iPhone goes on pre-sale midnight, Saturday. If you’re confused by all of this, that’s because it’s all very confusing. We’re still trying to get to the bottom of what the best buy is ourselves.